I love this idea. I guess it could be in quick messages and on group usercard and page. wouldn’t have to exclude each other. People could also put a Submit Support Ticket wherever they want - eg on their main custom nav, hamburger menu or discourse link next to LATEST etc. One issue that I can foresee is that for sites that use tickets in multiple ways you will want to have some ticket tags that are not shown to users. So maybe you want to set up at least another “reason” tag group for public tickets. But maybe some people will even want to allow their members to set status and priority. I can see this ballooning so would very much hope we can resolve the things I listed above first before we start on them. There are even other tasks that I think are more important, like revamping the tickets dashboard filtering/sorting/pagination. Including default filters and options on dashboard to quickly see only tickets assigned to me or only open tickets. Hey, great plugin! It’s helping my staff organize a ton of tasks, and keeping them accountable without forcing them onto an external tool. I unfortunately am having the same casing issue though. In my situation, going to my own user’s messages does not work, as in the steps you mentioned to replicate. I always get linked to the lowercase version of my name, i_like_pie, instead of the properly cased I_like_pie. It seems as though the tickets view is case sensitive on names, where the discourse messages view isn’t. Hey, I just un-installed this and wanted to provide some feedback. It was initially great, and I still think it’s a great plugin, but it ended up not working for us. Our staff of 6 tested it pretty aggressively for just over 3 weeks. We went through about 75 tickets overall, and decided that it just wouldn’t scale well for us. As recommended, we used this plugin alongside Discourse Assign. The pairing makes great sense. However, we quickly discovered that it fell short of our needs to view multiple staff members being involved in a single deliverable. This is obviously not the Tickets Plugin’s fault, but it did effect our usage of it. There’s debate on whether or not a task should have more than one assignee vs a single owner, but our situation didn’t allow for compromise on this matter. Our workaround was to create a new “ticket-topic” for each task, thats only purpose was to point to a unified discussion topic. This worked well enough at first, but even for a small staff of 6 this quickly grew out of control. We even set up a sub-category just for these new tickets, which did help a bit, but not enough. A good example of how absurd this became is that when a community member reports an issue (PM topic 1) that requires our attention, we create a new staff-only discussion (topic 2) that points to topic 1 so that we can discuss privately. Whispers unfortunately don’t help us much here, for unrelated reasons. Then, as this new topic requires multiple assignees, we create new tickets (topic 3 - up to topic 8) so that relevant staff members can be notified and their distinct ticket statuses can be monitored. All this for a single issue. Given the above, all the various ticket notifications quickly became noisy enough that it reduced the general usefulness of notifications as a whole. Our other issue was that, especially given our workaround leading to duplicate ticket-topics, the “Latest” views within the forum quickly suffered from self-inflicted spam and also became fairly useless. We tried to use tickets as group PMs to get around this, but then they wouldn’t show up in the tickets view, so we stuck to regular topics. Unfortunately, our primary reason for wanting tickets within Discourse in the first place ended up being the reason we changed our minds; it became overly present. In the end I am reminded that Discourse is built for discussion, and conceptually, bringing tickets in as literal topics breaks this model. In other words, of course Discourse thinks every time we create a ticket that we also want to have a conversation. Why wouldn’t it? It has no reason to care that a ticket might not necessarily warrant a larger discussion. The tickets view itself was also broken for us, in that using a url that combined different options (for example, to-do sorted by owner) would intermittently negate any options, giving us a list of all tickets. Our solution was to just use a single “to do” filter and re-do whatever other options we wanted if we felt compelled to. 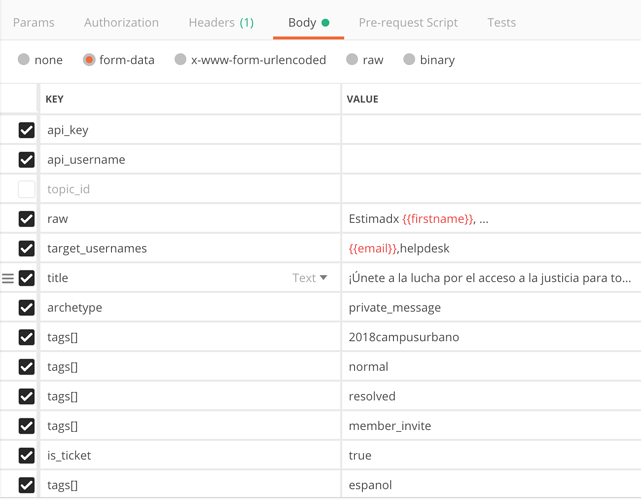 Speaking of the tickets view, it was generally very useful but we also did realize that there’s no way to express the effort that tickets require, which is important for us to evaluate how much work is being done as not all tickets are equal in scope. We need this to both plan upcoming work and to assess staff efficiency. There’s also the issue I mentioned in my post above about case sensitivity breaking individual staff members’ personal ticket views. None of these by themselves are outright horrible, but given our overall experience it made it further difficult to argue to keep using this plugin in place of an external purpose-built tool. We did end up moving to such a tool, and although I really wanted to keep using this plugin, I couldn’t form a good enough argument for it given everything above. I appreciate all the work involved here! Please don’t take any of the above personally, I’m just providing my own experience in case others in my shoes later on find it helpful. I would still recommend this plugin for those who don’t need multiple assignees on a ticket, and aren’t concerned with visualizing effort. Thanks for such a detailed rundown! I’ll reply in more detail soon. 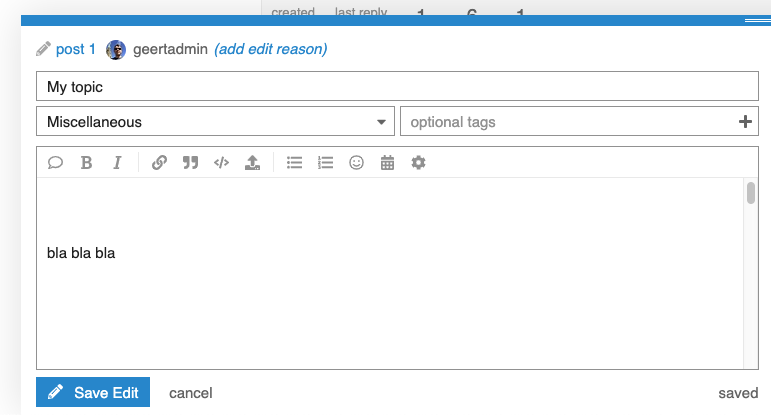 Nevermind I just noticed you have to add tags to the tag groups created by this plugin. Totally missed that. I’m checking this out now but can’t get the ticket tagging to work. When I edit a post the three dropdowns (priority, status and reason) are empty. Can’t select anything. Is there a setting I’m getting wrong somewhere? I have both ticketing, tagging and assigning turned on. I can tag posts normally just fine. I am having an additional similar issue though. I can’t seem to use the ticketing plugin with private messages. The ticket button appears but I can’t select priority, status or reason. I enabled tagging for private messages in my discourse settings. I believe there is a bug with the “tickets include group” setting. Leaving it blank solved the above issue. It may have been because the group was already assigned. Cool! I have been having this same issue since a recent update to discourse. I have now made this setting blank so will see what happens. I did notice that by manually inviting that group to the message brings the ticket tag pulldowns back to life. As regards @foohonpie feedback… thanks for it! It’s always good to have more people try it and give feedback on the experience. I don’t share your requirement that tickets be assigned to more than one person at a time, and that (along with your attempts to make it fit your requirement) seems to be a source of all of your assignment woes. Also all of your “Integration was both good and bad” feedback. As regards your “Other minor issues” feedback - I agree with you here. The interface for viewing and filtering tickets needs a review, both because it is buggy and because maybe there is a better way to do it. I’ve suggested some next steps above. Would love to hear input on those suggestions, or offers to help! This is a known issue that I do hope @angus prioritizes. Also mentioned above. given our workaround leading to duplicate ticket-topics, the “Latest” views within the forum quickly suffered from self-inflicted spam and also became fairly useless. We tried to use tickets as group PMs to get around this, but then they wouldn’t show up in the tickets view, so we stuck to regular topics. I’ve since discovered that we can mute specific categories, which would have solved this problem entirely. Humorously enough (because laughing saves me from crying ) the external tool we switched to, for as nice as it was, became a ghost town just as I feared. I may give this one another go with a change in approach this time around. It turns out, a good tool that gets used may be better than a better tool that doesn’t. How does one set “tickets enabled” to on? I have installed the Assign and Ticket plugin and I am able to assign a topic to someone and I can see tickets in /admin/tickets but I am unsure how to turn a topic into a ticket? Did I miss something? 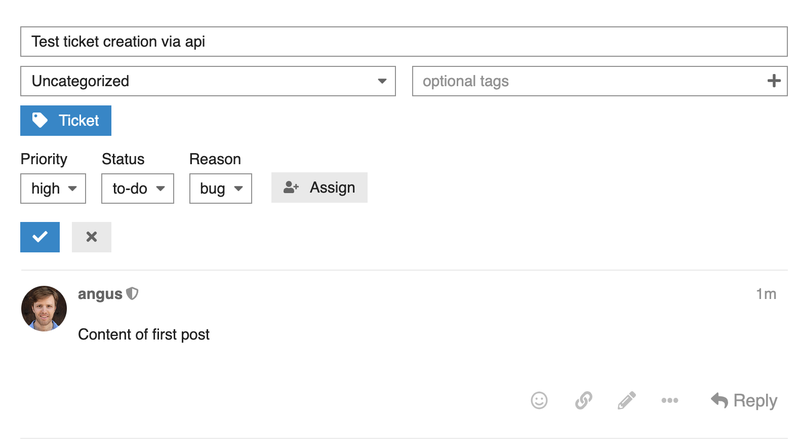 You can create topics or pms with tickets via the api, however there is currently no UI to add tickets in the composer (coming soon). 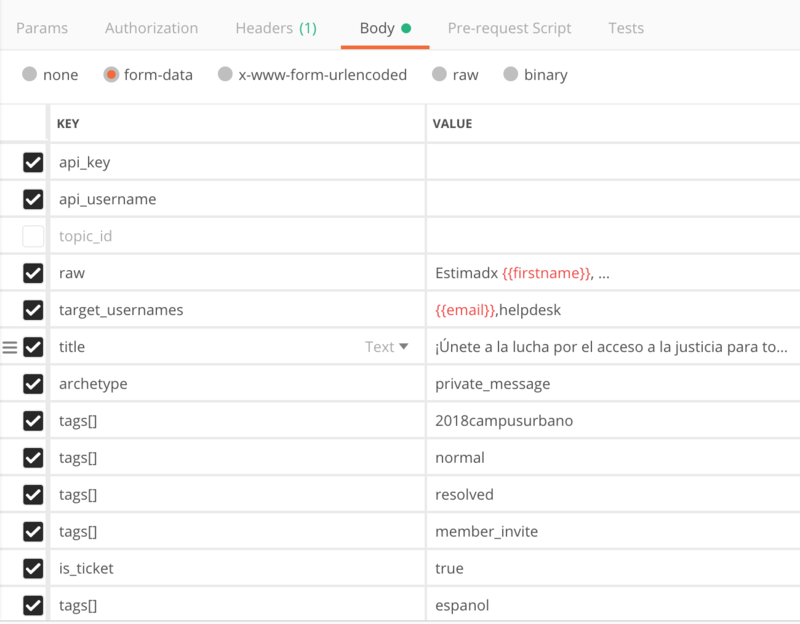 How does one create a ticket via the api? What is the update on the “coming soon” plan to add tickets in the composer? 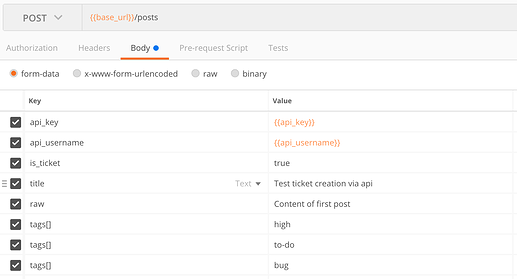 You just need to make a normal API request to create a topic, and add is_ticket=true as a parameter. @tobiaseigen Would you be able to set an agenda for this plugin? I’ll then see if I can fit it into my work agenda. Thanks @angus … apologies for the silly questions but how does one do a “normal API” request like the one in your screenshot? In my “edit topic” I don’t see the Ticket, Priority, Status or Reason? The “Unassign” also seems to be different in my setup? 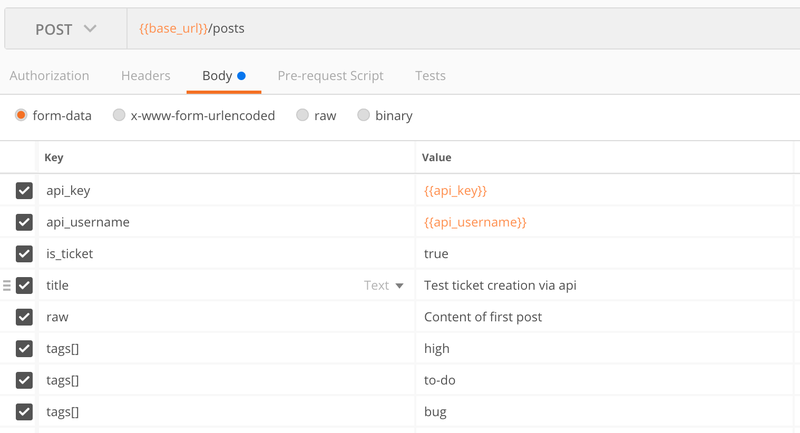 That screenshot is from Postman which is great for testing out API calls. In my “edit topic” I don’t see the Ticket, Priority, Status or Reason? The “Unassign” also seems to be different in my setup? Ok, so below is what my Edit Topic UI looks like. Does it matter if the topic is in wiki mode? I may give this Postman thing a whirl. I still hope to use this plugin someday as an option to provide support to my customers (users) - that they would be able to open a support ticket in some way. Looks to me like you need to enable the plugin. Are you sure you followed all the steps correctly to install it? It’s alot of fun! Here’s a screenshot to get you on your way. Note the is_ticket to enable the ticket and that you need a tags for each tag you want to add. Also, note that to assign tickets via the API you need to do a follow-up call which I have not figured out how to do via postman. maybe there’s a conflict with another plugin? can you try disabling the voting plugin temporarily and see if you see the TICKET button when editing a topic title?